A product or service is merely a solution, an end and by no means anything close to what consumers are trying to achieve. A man doesn’t want to ride a bus, he merely wants to go back to his loved ones. Yet he has to go through the mayhem of the consumer world in order to receive the meager satisfaction he strives for. This create an internal turmoil, a roller-coaster ride that takes place as the consumer understands, evaluates and finally experiences the product. Knowing this, the producers try to reach out to the consumers to feed their needs. A consumer journey occurs when the consumers have a need, and go through several emotional peaks and valleys before their desires are fulfilled. No worries! This is part of the relationship that builds up between these two entities. Now just like any relationship, communication is vital in order to establish that the needs of one another are clearly defined. The significant difference between the consumer expectations and the producer brings about the infamous “reality gap”. Now this is where we come to close the reality gap, to make it feasible for the consumer to have the interaction they so dearly need to get exactly what they want. 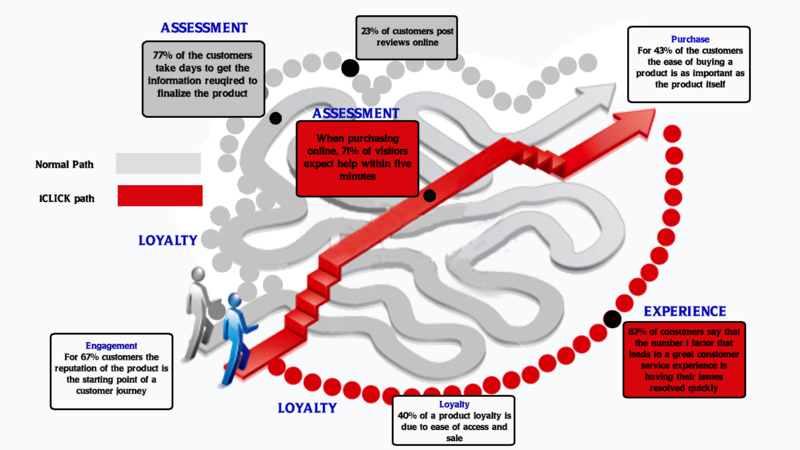 The journey starting from the consumer’s requirement to our product’s end result, is called the consumer journey map. Come, let’s look at our map. Engagement: The starting point after the consumer goes through a negative experience such as engine dysfunction. The consumer looks for other alternatives in order to replace his current faulty good. Here is when he starts researching other alternatives to solve his issue. Assessment: This is the point where the consumer checks his opportunity costs and his balance between quality and feasibility. Here comes the important “moment of truth”, where the seller must convince that the consumer is getting his money’s worth. This point is where communication Is vital, and highly influential. Purchase: The final moment where the consumer makes his decision and gives in to the influences that that kept urging him to buy the product. Experience: The nerve-wrecking period of the producer as this is the time when he keeps his fingers crossed, hoping that the product behaves as expected. This is the decisive moment that would cause consumers to advocate for the product. Loyalty: The epitome of business lies in loyalty, the one strong feeling that brings customers back. This is the end result that every firm strives for, a consumer base that will stick to the relationship no matter what! At every stage of the marketing funnel, it is the firm’s prerogative to constantly sway the consumers to into the right product, and with 53% of online customers disconnecting due to the lack of human-interaction. It’s becoming essential to provide a ‘Face’ to your business these days with simple live chat solution. This is where a product such as1CLICK’s Live Customer Support Software comes into play, as the highway abridging the ‘consideration’ to ‘purchase’ stage in the consumer journey. With Live Video or Voice Assistance available on your website, customers can easily convey their needs and this will help bridge the gap between your customer and you. A study by the Lee Resource Inc showed73% of consumers have chosen to spend more money with a company because of a history of good service experiences. Good service experiences can be brought about with products built for creating the ‘WOW’ factor in your customer service, and 1CLICK’s Live Support Software was built to help you do just that. This entry was posted on December 24, 2014 by Clifton Lobo in Lets talk business and tagged Customer Journey.